When I first started this writing gig I had no idea of the opportunities I'd get to meet amazing, caring, thoughtful people who've dedicated their lives to providing their families and communities with food that is, as Slow Food likes to put it, "good, clean and fair." In terms of meat animals like cattle, sheep, pigs and chickens, it means that they've been raised humanely, on pasture, where they can live with other animals, feeling the soil under their feet and the sun on their backs. These farmers feed their animals none of the genetically modified corn and soy that most conventionally raised animals are raised on. Really, it's exactly the picture of the farm that we all carry around with us from the stories read to us as children. Les and her dogs at Jo-Le Farms. 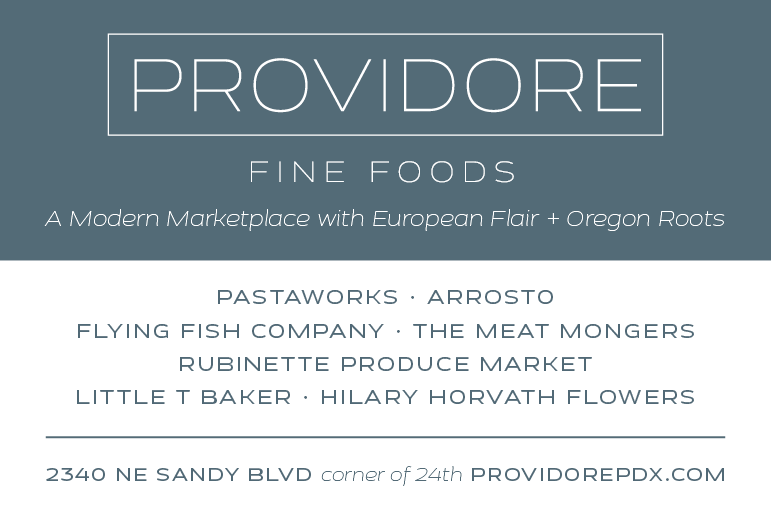 Why am I so convinced that pasture-raised meat is better? Well, everyone's heard the phrase "you are what you eat" when it comes to junk food versus healthy foods. But I heard a phrase a few years ago that goes "you are what you eat eats," and it kind of blew my mind. In other words, if the animals we eat have a diet of the food that they are intended to consume—found in healthy pastures—rather than commodity grains laced with antibiotics and chemicals, then it follows that they'll be healthier animals and the meat and milk they provide will be healthier for us to eat. And when it comes time to die, the larger animals are either killed in their pastures instantly with a swift shot behind the ear, or trucked a short distance to a humane processing facility where they aren't waiting in fear, listening to the panicked sounds of other animals. It had been awhile since I'd bought a lamb (really a nearly-year-old sheep) because I hadn't found a farmer nearby who had pasture-raised sheep available. 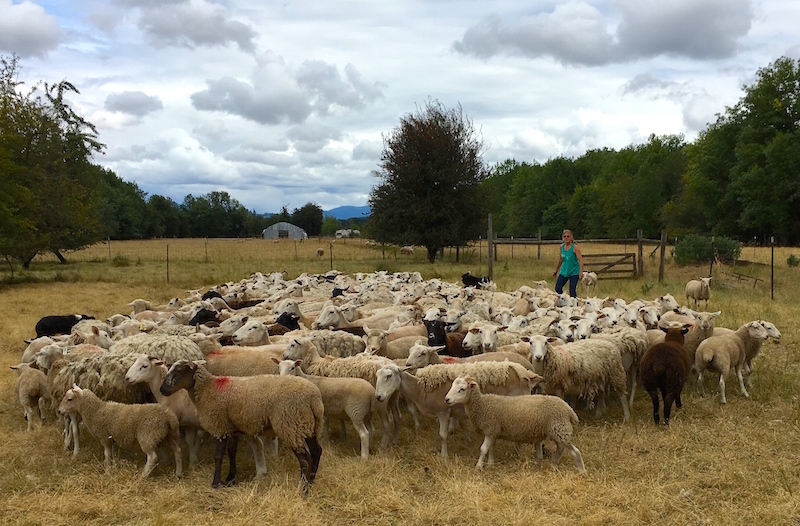 But when I visited my friends Kendra and Ivan at Shimanek Bridge Farm, who raise cattle, pigs, chickens and turkeys on pasture, they introduced me to their neighbors, Les Carter and her husband Jon of Jo-Le Farms, who raise—get this—pastured sheep! Les mentioned that they'd be slaughtering a few of their sheep in the near future, and I nearly jumped into her arms. She promised to call when it was time, and a couple of weeks later she contacted me to let me know when they'd be available. 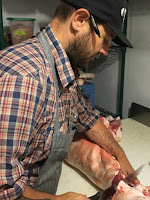 I then called my friend Ben Meyer of Old Salt Marketplace to see if he'd help me butcher it, a process I prefer because I get to decide whether I get chops versus racks and bone-in or boneless roasts. Animals like goats and lambs are generally small enough to carry in the back of my Mini Clubman, Chili, so I pulled up in front of Ben's place and he graciously carried it inside for me. 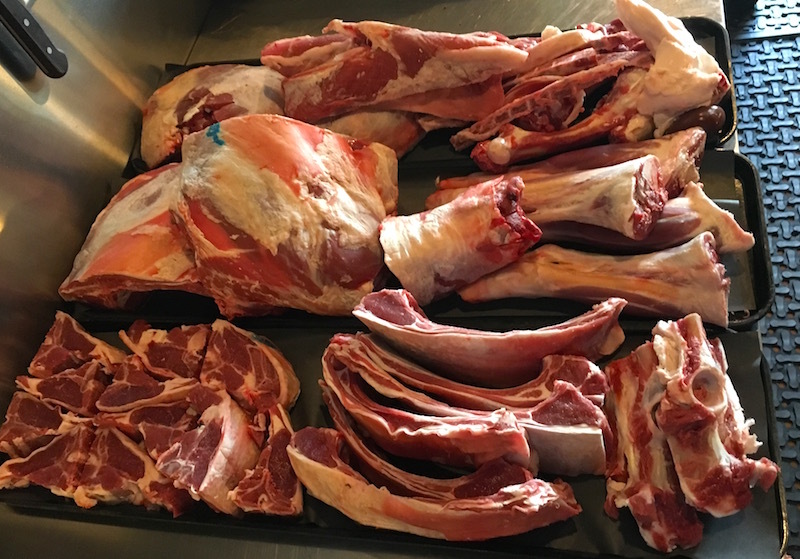 An hour or so later I walked out with a cooler-full of cut and wrapped chops, ribs, shanks and roasts, and I saved out a big bone-in shoulder roast for our first lamb dinner in some time. Braised lamb is the easily one of my favorite ways to cook and eat a lamb roast, though I've had several grilled boneless leg roasts that run a close second. 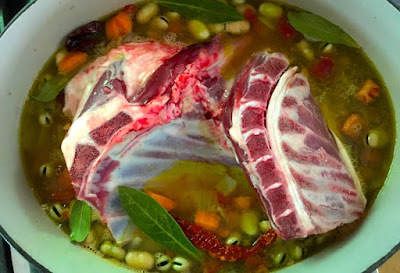 Braising is also one of the easiest methods for cooking lamb, since all you have to do is add some vegetables and liquid to the lamb in a pot and cover it for two or three hours in the oven. The lamb slowly melts into fall-off-the-bone tender chunks, the liquid and meat juices meld into gravy and the vegetables and any herbs give it a marvelous depth. 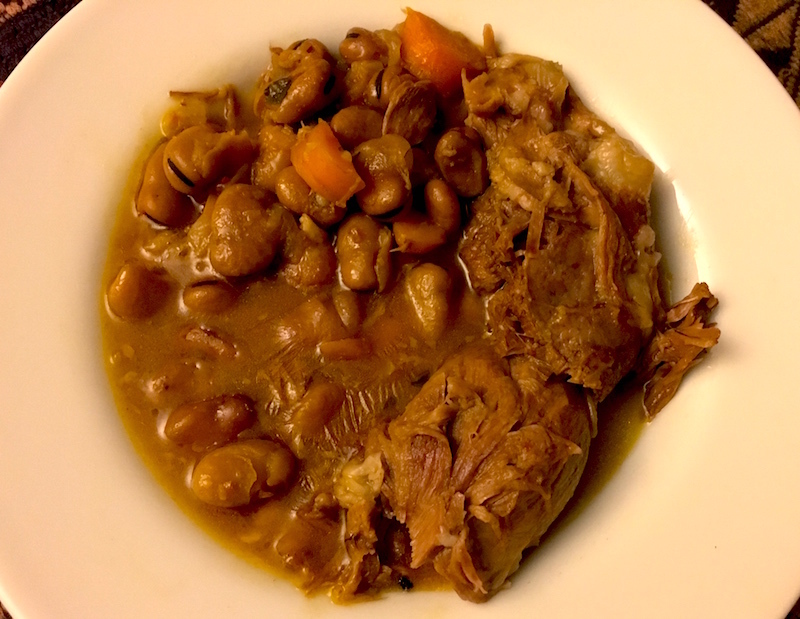 I added a pound of fava beans from Ayers Creek Farm, a cup or so of tomatoes I'd just roasted, and that night we sat down to our first lamb dinner in quite some time. And now there are so many more lamby meals to look forward to this winter, thanks to the hard work of Les and Jon. I can't wait! Heat olive oil in large Dutch oven over medium-high heat until it shimmers. Add onion and sauté, stirring occasionally, until it is tender. Add carrots and garlic and sauté until tender. Add lamb, bay leaves, herbs, salt, fava beans and stock. Cover and place in oven. Check every half hour or so to make sure there is still liquid; if it has all been absorbed, add water or stock. Braise for 2-3 hours until meat is ready to fall off the bone. Remove meat, bay leaves and any stems from herb sprigs. Cut or pull the meat off the bones and chop into serving-sized pieces. 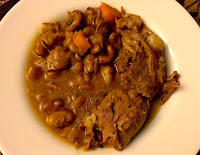 Place in serving bowl and ladle beans, vegetables and gravy over it. Serve with hunks of artisan bread for sopping up the juices. Check here for more recipes for lamb, then read farmer Les's recipes.